Surprise someone special with our indulgent Oxfam Fair Trade chocolate gift set. 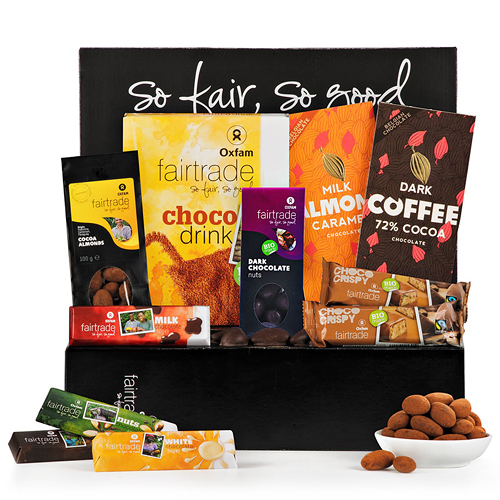 This elegant black gift box is filled with an abundance of the best Fair Trade and organic chocolate and nuts. Discover cocoa-dusted almonds, dark chocolate covered nuts, a delicious cocoa powder drink, and a wealth of white, milk, and dark Fair Trade chocolate bars. Decadent chocolate tastes even better when it is all for a great cause! Please note that the bowl is not included. Ingredients: Cane sugar, cocoa butter, milk powder, cocoa mass, almonds (5%), vanilla. Allergy Advice: Contains milk and almonds. May contain traces of soy and other nuts.